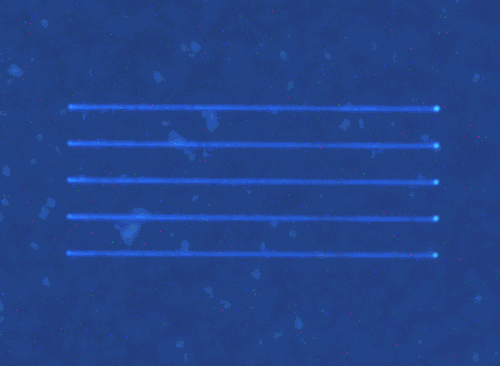 This protocol has been designed as an example of nanolithography using FluidFM®. Here we print a solution containing a fluorescent molecule, 4’,6-diamidino-2-phenylindole (DAPI), on a hydrophilic glass surface coated with DNA. While the protocol was developed with the FluidFM BOT it can also be used with FluidFM ADD-ON solutions. The surface of the Nano Pipette needs to be hydrophobically coated. We use Sigmacote®, a silicone based solution, according to Silicone coating protocol. Freshly prepare a 10% glycerol, 1mg/ml DAPI solution in ddH2O. Dispense 1µl of this solution into the probe reservoir, according to "Probe preparation" instructions. In order to avoid drying of the solution, it is strongly recommended to load the probe on the BOT as fast as possible after this step. Willco-Dish® need to be treated to make the glass hydrophilic, and therefore allowing them to bind DNA. Here we propose a treatment using gelatine. Other surface treatment procedures, like Plasma treatment, can also be applied. Cover the bottom of the dish with a 0.2% gelatine solution (filtrated). Let the surface of the dish dry out. The dish is ready for coating with DNA. Because DAPI binds strongly to A-T rich regions of DNA, coating of the dish with DNA will therefore help the deposition of DAPI solution during printing. This step is optional as gelatine will also bind DAPI molecules. However, if using another hydrophilic treatment such as plasma treatment, DNA coating of the dish is strongly recommended. DAPI has a maximum emission wavelength at 461 nm when bound to DNA, 488 nm when not bound to DNA. Prepare a 5 mg/ml DNA solution. Filter the solution through 0.20 µm pore. Cover the surface of the Willco-Dish® with the filtered DNA solution (1 ml is sufficient). Pour out the DNA solution, and let the Willco-Dish® dry out. Load the probe into the probe holder in the right port of the BOT. Load the coated Willco-Dish® in the left port of the AFM. Make sure that the dish is tightly fixed on the holder. Perform the Prepare system workflow. Use the "Line printing workflow" from the software. It is possible to use a predefined pattern, by creating a file with xy coordinates, printing speed and pressure. The BOT will print line between each given point in the file. Each parameter must be separated by a coma. First column set the x position in µm. Second column set the y position in µm. Third column set the speed for printing in µm/s. The last column set the pressure in mbar. Also, there are special control instructions to e.g. retract and approach. Use the "Print from file" workflow from the software and select your file. Press the Ok button to start printing.